Salford Red Devils lead the way with embed the pathway programme. Salford Red Devils are offering young players to take the first steps onto the ladder of professional rugby league. The upcoming “Embed the Pathway” training camps will give boys between the age of 12-14 the chance to hone their skills under the tuition of the Red Devils professional coaches. Embed the Pathway has proved very successful in the past for the Red Devils, with many of our current u'15’s academy scholarship cohort graduating through the programme. 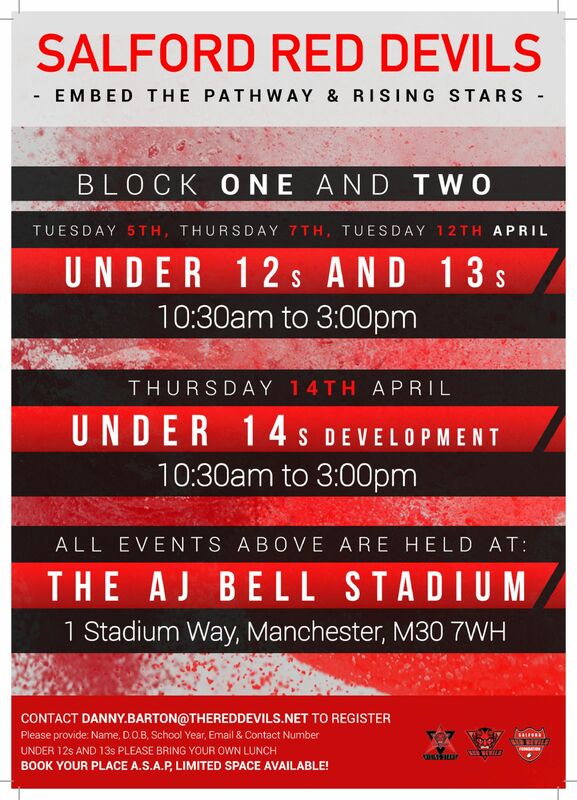 The camps will be taking place at the AJ Bell Stadium during the April half term break and offer up and coming rugby players the opportunity to train in an professional environment. Those interested are encouraged to register their place A.S.A.P as places are limited and are handed out on a first come first serve basis. Email danny.barton@thereddevils.net to reserve your place.